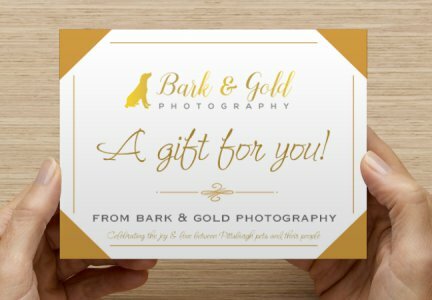 For the pet parent in your life, my gift certificates* make the purrfect gift! Each certificate includes a session and $500 product credit to ensure the recipient walks away from our time together with an unforgettable experience and heirloom-quality products by which to remember it. Gift certificates are priced at $500 and may be purchased below. Physical gift cards are sent via snail mail or you can request a printable electronic gift card that will be delivered via email that you may print on your own (please choose desired option upon checkout). Gift cards will be sent once payment has cleared. *Gift certificates cannot be redeemed for cash and expire one (1) year after the date of purchase. Gift certificates cannot be combined with other offers. Additional limitations and other terms and conditions may apply. Gift certificates may be applied toward full sessions and product orders only. They may not be applied toward Puppy Love Sessions, Rainbow Sessions, Fine Art Pawtrait Sessions, or limited edition sessions.